Alice Conteh didn’t always eat oranges, though they hung plentifully from trees near her village latrine. Alice, like many others, believed oranges caused malaria. But she was a single mom with four mouths to feed, so she picked and sold them at a market about 2 miles from her village. Malaria and typhoid were a part of everyday life, she thought, so if people wanted to buy oranges from her, she wasn’t going to stop them. When Alice wasn’t selling oranges, she would work as a day laborer, weeding or harvesting crops, depending on the season. For 8 hours of work, she would earn less than $1. 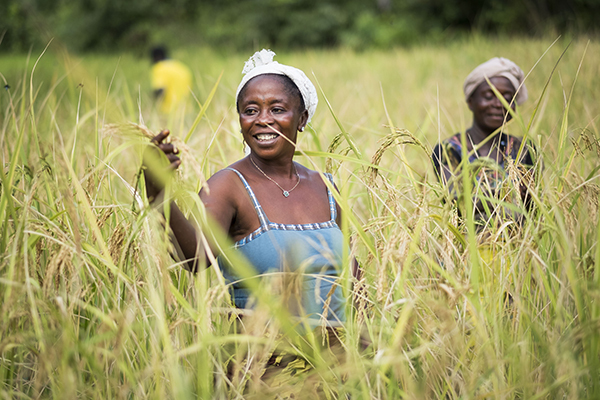 Alice says life had always been a challenge for her in Longeama, Sierra Leone, but she managed to put rice on the table. 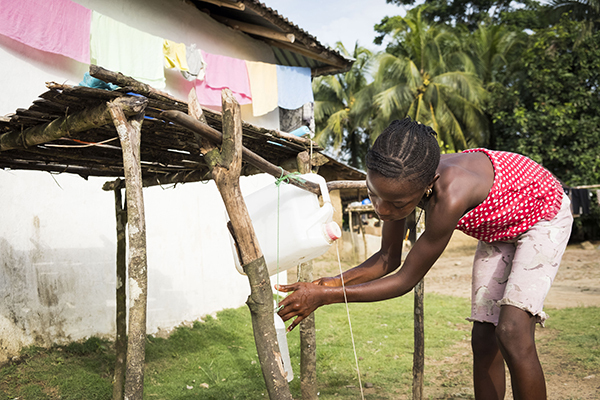 However, when Ebola hit the country in 2014, her life became even more difficult. Sierra Leone’s government started to enforce quarantines to stop the spread of the disease. People were forced to stay in their homes for days at a time. For 3 months, Alice couldn’t leave her village. Checkpoints prevented typical movement of goods and labor throughout the country. Productive farm fields were abandoned, and slowly taken over by nature. Some days, Alice says there was no food to eat. At night, people would sneak into the bush to scavenge for yams, taro or anything else edible. The country was plagued by rapid rates of inflation, and food prices increased—in some cases, even doubling. The district of Kenema, where Longeama is located, was hit particularly hard. Alice thought once the virus was contained, things would return to normal, but the price of staple foods didn’t drop. In April 2017, Alice started receiving $90 once every 3 months through a Catholic Relief Services food program. As a complementary activity, CRS led workshops for 263 peer educators—all leaders from local communities. The peer educators, including Alice, were taught about financial management, nutrition and hygiene. After the workshops, peer educators like Alice took this knowledge back to their villages, reaching more than 5,000 people in Kenema. As a result, communities now have a greater variety of vegetables and fruits growing in their backyards, and people wash their hands more regularly and eat a more diverse diet. Now that Alice and others in Longeama know the nutritional value of their harvests, they consider it when they cook. In the center of the village, Alice sits with a group of people she trained. Their eyes light up as they exchange recipes. One woman speaks excitedly about how she prepares taro. Her hands hold an imaginary knife that moves through the air, showing others how she dices the vegetable. She then tells the group how she boils the taro and serves it covered with meat or fish gravy. Since the program started, not only are people eating a greater variety of foods, but more families are eating three meals a day too. “Food is life!” Alice proclaims. The others smile and nod. They’ve also learned to use local substitutes to insulate them from the increase in food prices. They eat beans and nuts when they don’t have fish, and store dry pepper for when fresh pepper isn’t available or is too expensive. Outside the mudbrick homes with tin roofs, you can see hand-washing stations: two plastic bottles strung over sticks, one filled with water and one with soap. Behind the houses, gardens flourish with taro, yam, white pepper and potato leaf. With knowledge from the financial management workshops, the village organized into 3 groups of about 30 people. The groups help people farm together and save money. Alice meets with her group every Wednesday morning to contribute to its savings, including a social fund that helps members during emergencies. Prior to the program, 69% of participants had no savings. Now they all do. A few days a week, Alice works in a nearby rice field with her group. A fellow villager, Mohamed Sherrif, owns the land and doesn’t charge them to grow rice there. Just as Alice was trained as a peer educator, CRS taught Mohamed and 174 farmers like him how to improve their agricultural practices. Mohamed shared this knowledge with other villagers. “We have taught that working together, everyone will be better,” says Alice. 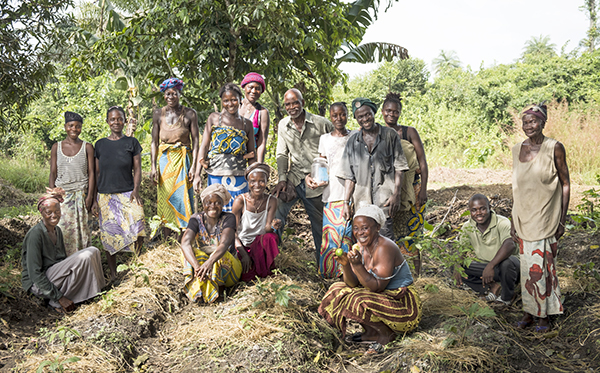 The number of families cultivating more than 2 acres of food has increased from 3% to 42% in Kenema. Alice no longer worries about what to feed her family. All four of her children are in school, and she has bought three goats in the past year. Without easy access to a bank, the goats are like her savings account in case disaster strikes again; she can sell them for quick cash. With their basic needs satisfied, Alice, Mohamed and others in Longeama are now brainstorming how to improve the village infrastructure: the school, sanitation systems, the structure of the homes and latrine. The oranges still grow over the roof of the village latrine, which now also has a hand-washing station in front of it. Alice still picks the oranges, but now they aren’t just sold. Almost everyone in the village, including Alice, loves to eat them.